A noticeable tremor went through the U.S. media establishment on Monday, when well-respected New Yorker music critic Sasha Frere-Jones announced that he was leaving the venerable magazine to become the executive editor of a site many people have probably never heard of: called Genius, it was formerly known as Rap Genius. In a nutshell, it allows virtually anyone to annotate or make notes on any kind of text document, anywhere on the internet. Sounds like chaos, right? As Foster Kamer and a number of other media insiders pointed out following the news, the fact that Frere-Jones might be interested in jumping from the magazine to an unproven digital-media startup shouldn’t come as a huge surprise, given that he did more or less the same thing in 2010, when he left the New Yorker to join The Daily — Rupert Murdoch’s ultimately futile (and expensive) attempt to build a tablet-based news organization. Genius may not be backed by Rupert Murdoch, but it also isn’t a tiny, struggling startup: after raising money from leading Silicon Valley VC Andreessen Horowitz in 2012, the company raised a fairly massive $40 million last year, which valued the venture at about $500 million. Frere-Jones certainly wouldn’t be the first traditional journalist to be seduced by the prospect of a payoff in startup equity, along with the challenge of trying something new. 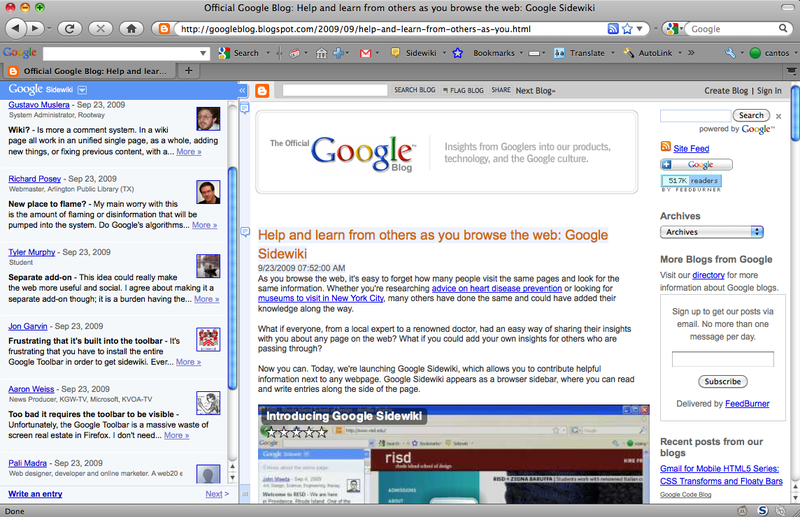 Over the past decade, there have been a number of attempts to “annotate the web,” including browser plugins that would display user-contributed notes beside a page and widgets that would pop up windows when you hit a site — Google even had one for awhile called Sidewiki — but not enough people ever used them. The impulse is a fundamentally web-like one, however: to allow anyone to contribute their knowledge on a topic, just as Wikipedia does. In fact, Marc Andreessen of Andreesen Horowitz said when he invested in Genius that his interest in the company stemmed from the earliest days of his involvement in the consumer web, when he developed one of the first graphic web browsers, known as Mosaic. 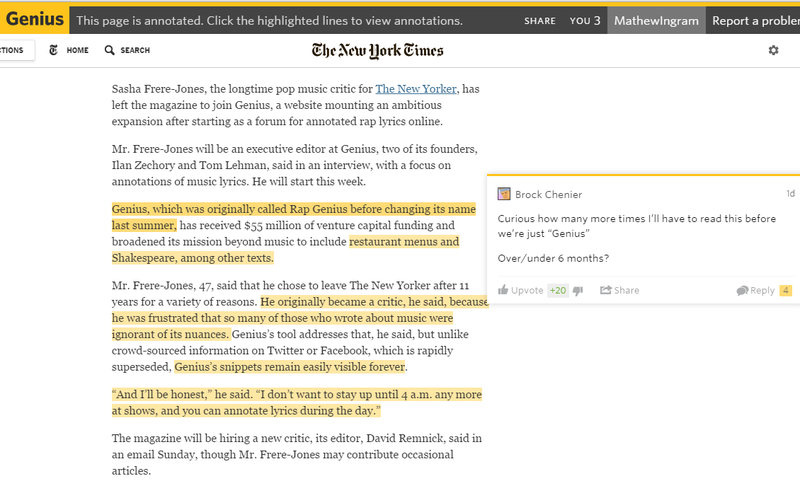 “It seemed obvious to us that users would want to annotate all text on the web – our idea was that each web page would be a launchpad for insight and debate about its own contents.” But the feature known as “group annotations” was too expensive to implement. The problem with this kind of approach, of course, should be fairly obvious to anyone who has followed the evolution of Wikipedia — not to mention anyone who has seen and been repulsed by reader comments on news stories. The issue with comments is that plenty of people think they know something but actually don’t (or just want to scrawl the equivalent of verbal graffiti where everyone can see it), but the downside of the Wikipedia approach is that editing or contributing becomes something that only a tiny cabal actually does. Genius inadvertently became an example of the downside of its free-for-all approach when co-founder Mahbod Moghadam posted some offensive and misogynistic comments on the manifesto written by multiple killer Elliott Rodger. Moghadam was eventually forced to resign, and the episode only reinforced the impression that Genius was run by “bro-grammers” with an over-inflated sense of their own worth (those who knew them in university, meanwhile, have described them as “potheads who debated Kierkegaard”). Much like early web communities such as Slashdot, Genius deputizes its own members to moderate the annotations: annotations must be approved by users, and over time regular contributors can earn what the site calls IQ points — which in turn allow them to remove comments or put users in the “penalty box,” a form of sanction that prevents them from doing anything for a specific period of time (Slashdot’s approach involves what it calls “karma” points, which give users the right to moderate). Moderating bad behavior is one challenge, but what could be an even bigger one is monetizing the content that it annotates, as Vox writer Timothy Lee points out. Editing song lyrics or even web pages isn’t likely to be something that appeals to a vast number of people — just as only a tiny number of contributors ever edit a Wikipedia page. So where will Genius get the kind of engaged readership that will appeal to advertisers? Trying to build a network of curators, weed out spam, all while keeping it all organized can be quite tough!